One day, when he was outside his bungalow to practice his daily concentration exercises, Salim saw on the ground, not far from him, an enormous eagle holding something in its talons. 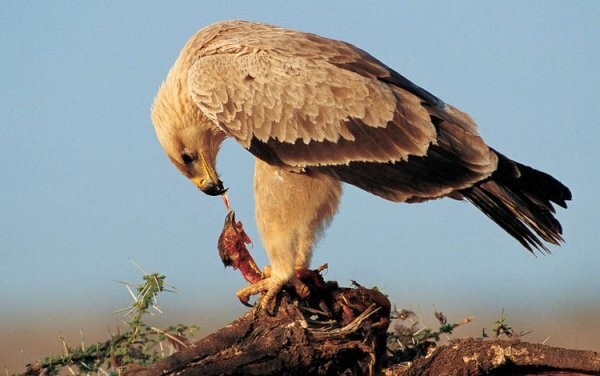 With his beak the eagle tore off a morsel of the prey that he was perching on, then he lifted his head and, with extraordinary dignity and at an impressively leisurely pace, he looked right and left before dropping his head back to his prey. Salim stayed still, fascinated by the formidable size of the bird of prey, and he wondered, in amazement, how a bird so large and heavy would be able to take off. He waited curiously, not daring to make a noise, when, suddenly, he saw the eagle pushing hard against the earth with his feet while unfurling his enormous wings which he beat so strongly that, very quickly, he rose into the air. He had climbed just a few meters when he slowed his wing beats considerably until, finally, he was able to hold himself completely immobile, his wings wide open, gliding and still climbing ever higher into the incandescent skies of India. An astounding silence suddenly pervaded Salim who stood transfixed and filled with wonder. He had just realized something vital to his spiritual practices. This remarkable bird had, effectively, just taught him that it is the quality and the intensity of one’s initial efforts that prove decisive in allowing a seeker to detach from himself in order to be able to ascend to higher and higher states in the sky of his being. He needs to learn the delicate art of knowing when and how to relinquish his effort in order to be able to, so to speak, “glide” like an eagle.